For me, one of the many things that I enjoy about going home for couple of days is checking the ‘Time Out,’ page on the Internet and having a peek at the popular events in London that are occurring during the week. On this occasion, as I had a look on the page The Museum of London’s ‘Sherlock Holmes: The Man Who Never Lived and Will Never Die’ exhibition came to my attention. Also, as I live towards the end of the Central line, it is incredibly easy for me to take a trip into London for the day. Firstly, before entering the exhibition itself, there was much excitement between my mum and me, due to the entrance being a huge bookcase and the guide of the exhibition requesting for us to find the doorway. When entering, I immediately saw the oil painting of Sir Arthur Conan Doyle dated from 1897 that hung upon the wall. From the artist’s portrayal of Conan Doyle, he immediately comes across as a man of intelligence and I thought that the artist’s portrayal of him was particularly interesting as it also offered a look on Victorian portraits. As we continued to walk around the exhibition, the more and more knowledge we gained from the character of Sherlock Holmes that we had not known before. There was a great use of mixed media on display, from manuscripts to illustrations; to short clips of Sherlock Holmes’ television series and films that have been produced from different times; as well as, audio clips from the stories in the background. 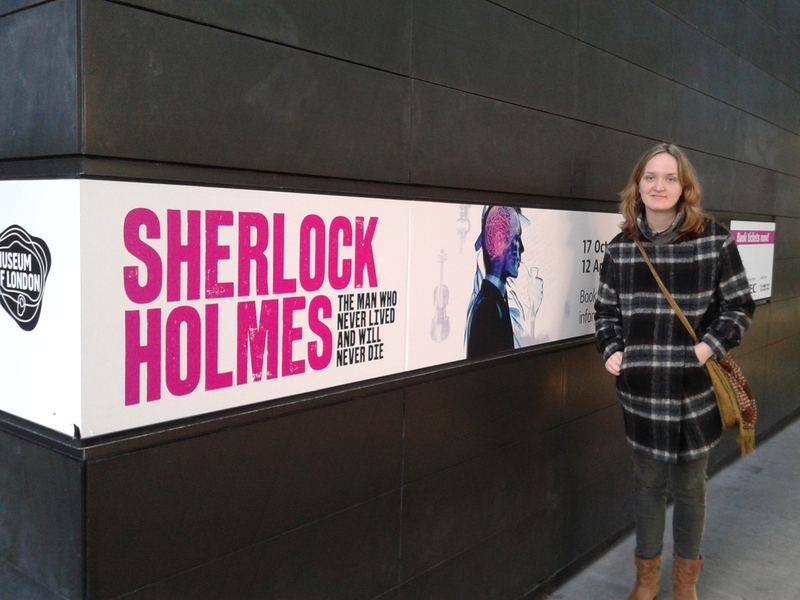 By the Museum of London’s wide range of material, it created a huge curiosity for me as it enabled me to understand the great impact that Conan Doyle’s character, Sherlock Holmes, had upon society and the long line of films adaptations and television series that have been produced as well as how the figure of Sherlock Holmes has transcended over time. I also appreciated that there was not only the opportunity to view the excellent handwriting of Sir Arthur Conan Doyle’s original manuscripts, but to also have the chance to glance upon the first credited detective fiction short story of Edgar Allan Poe’s ‘The Murders in the Rue Morgue.’ It is known that Conan Doyle was an admirer of Poe’s work and of his creation of the brilliantly analytical detective of Monsieur C. Dupin. Due to currently studying Conan Doyle’s ‘Hound of the Baskervilles,’ and Poe’s ‘The Murders in the Rue Morgue,’ in my Crime fiction module with Charlotte Beyer, I found that aspect of exhibition most engaging, as well as, having the chance to compare their markedly different handwriting which I found most intriguing. Playing on the wall besides such manuscripts, there was a filmed interview with Sir Arthur Conan Doyle from 1927 describing the growth of his creation, Sherlock Holmes, and the response he had received from female fans that considered Sherlock Holmes to be real. One reaction that I found particularly humorous was that a woman wrote to him claiming that she would love to be Sherlock’s maid and that she had a great hobby of bee keeping, as bee keeping had recently appeared in one of Conan Doyle’s short stories at the time. One of the rooms that I found particularly interesting to explore was a collection of paintings of London by a variety of artists, as it is known that London held a central role within Conan Doyle’s stories. The Museum displayed Victorian London through many illustrative and historical elements; my two personal favourites were an etching of London from a bird’s eye view as seen from a hot air balloon in 1884 which men had to take shifts to complete over a period of months to Claude Monet’s painting ‘Pont de Londres,’ capturing the thick fog of Victorian London in 1902. Continuing on from this section of the exhibition, there were many props and costumes on display; including the Belstaff coat and blue scarf that is used in BBC’s Sherlock series, featuring Benedict Cumberbatch. As well as, forensic kits, photographs, typewriters, and many other props used in other television and film adaptations. I personally believe that the exhibition as a whole was appealing for not only fans of Conan Doyle’s literary works, but as well as, for people that have an interest with the Benedict Cumberbatch television series, the many film adaptations of Sherlock Holmes and also the fascinating history of London. Furthermore, if you go to visit the Museum of London, you are certainly in for a treat as it is a short walk to St. Paul’s Cathedral or you can also cross over the Millennium Bridge to the Tate Modern or the Globe Theatre after your visit to the Museum.